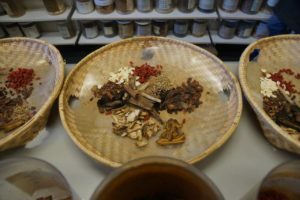 Chinese medicine has a wide range of therapeutic technique at its disposal, including herbs, acupuncture, moxibustion, diet, massage, and specialized exercises, some of which involve breath training. Each of these techniques is a field of study with its own specialists, although the training of every Chinese doctor includes at least some introduction to their principles and applications. 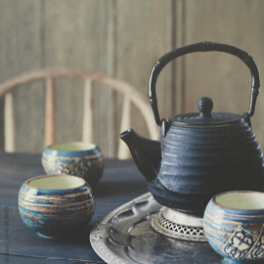 Herbs (and Acupuncture), however, are by far the most common form of therapy in Chinese medicine. Herbs can be applied in decoction (like soups), in powders, pills, plasters, tinctures, and syrups. Modern dosage forms include ‘instant’ preparations, ampoules, capsules, and even I.V. drip for emergencies. The most common form, however, remains the decoction. Chinese herbs are rarely prescribed singly. Following diagnosis, a standard formula is chosen for the condition, and then ‘sculpted’ by the addition or deletion of different but related herbs until the prescription exactly suits the state of the individual patient. The effect of the prescription upon the patient is assessed at the next consultation and the herbs again adjusted accordingly. 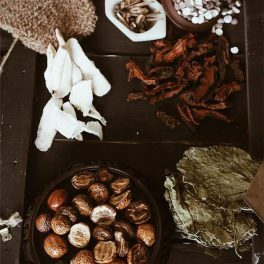 For the reasons outlined above, Chinese herbal gynaecology can be seen to provide a viable complement to Western medicine, in an area where it is much needed. It supplies a comprehensive framework for the classification and treatment of the ‘vague’ amorphous symptoms accompanying a functional disorder, by re-establishing the proper functioning of the organism with methods both more gentle and more subtle than contemporary medicine can offer. Moreover, when necessary, it’s non-invasive, conservative treatment combines well (see more) with Western medical techniques, as for example in the treatment of structural diseases or the side effects of more drastic therapies. Length of a course of treatment ranges from as short as one or two weeks in cases like simple vaginal discharge, to three or four months for dysmenorrhea, or even up to a year or longer in treatments for endometriosis or infertility. Yet while on average treatments may be slower than with Western medicine because of the more conservative methods employed by the practitioners of Chinese gynaecology, and while no treatment, Western or Chinese, can ever claim 100% success, still it is generally conceded that of all the departments of Chinese medicine, gynaecology obtains the best results. Learn more about length of treatment on our FAQ page.